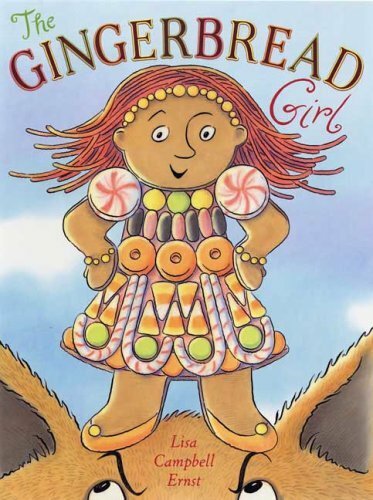 Sylvia Liu Land: Gingerbread Picture Books! 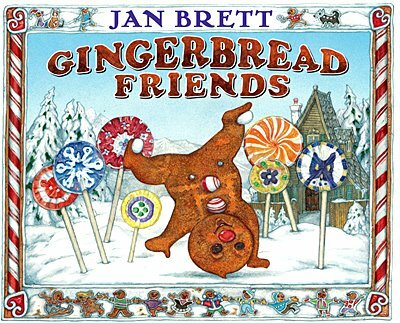 Gingerbread Friends, written & illustrated by Jan Brett (G.P. Putnam’s Sons, 2008) A sequel to Jan Brett’s enormously successful Gingerbread Baby (see below), the Gingerbread Baby now lives in Mattie’s house, but is lonely. One day, he slips out to the village to try to find new friends. Meeting toys and creatures, he unsuccessfully sings variations of his plaintive song, “I’m the Gingerbread Baby, peppy as can be. 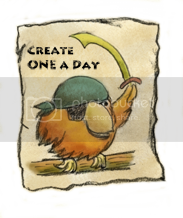 I’ll be friends with you, if you’ll be friends with me.” He comes home dejected but finds a surprise prepared by Mattie (that will delight young readers when the final page expands four-fold). 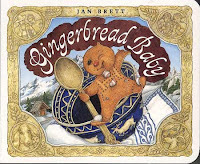 Gingerbread Baby, written & illustrated by Jan Brett (G.P. Putnam’s Sons, 1999) A young boy named Matti bakes a gingerbread boy, but a gingerbread baby pops out of the oven. The baby runs from the cat, the dog, the goats, the girls, and others. 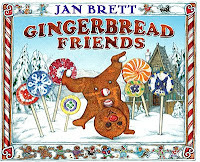 In her trademark style of intricate peep holes that hint at a subplot, Jan Brett shows Matti baking a beautiful gingerbread house. Can the gingerbread baby outrun the hungry fox and can Matti help save the day? Jan Brett’s intricate Nordic winter scenes make for a cosy and heartwarming bedtime story. 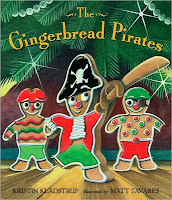 The Gingerbread Pirates, written by by Kristin Kladstrup and illustrated by Matt Tavares (Candlewick 2009). 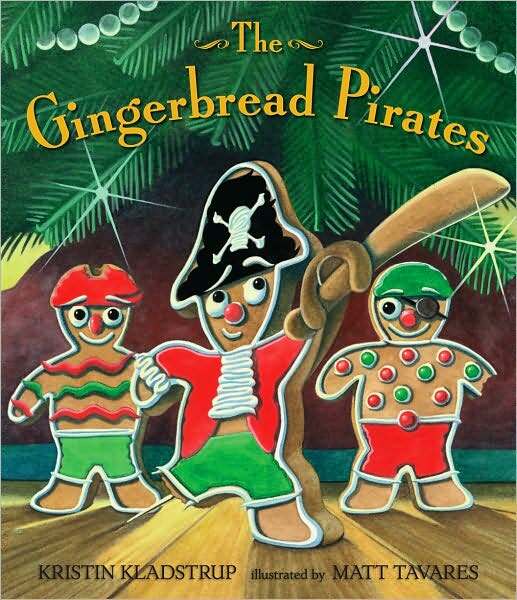 Although not a runaway gingerbread story, I raved about this book in my pirate picture books post, and it is perfect for the holidays. The story combines classic story themes (hero's quest, toy that wants to be real, Christmas magic) in original and heartwarming ways. The plucky hero, a gingerbread pirate, not only saves his crew from the evil cannibal in a red suit (Santa), but also achieves his dream of becoming a real toy to be loved (though being a pirate cookie looked awfully fun). The art nicely complements the text with its warm and soft tones, and the expressions on the cookies are priceless. The Gingerbread Cowboy, written by Janet Squires & illustrated by Holly Berry (HarperCollins, 2006). 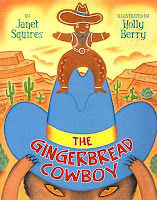 This retelling of the classic gingerbread man story is set in the American West with a gingerbread cowboy. The cowboy runs away from creatures specific to the desert, like a horned lizard, a road runner, javelinas, and long-horned cattle. The gingerbread cowboy meets his match when he lets a coyote take him across a river. 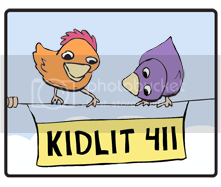 Unlike the other picture books, this one is true to the original story with its unhappy ending. I enjoyed the warm and lively illustrations that were evocative of the desert, and the story's rollicking vibe ("Giddyup, giddyup as fast as you can. You can't catch me, I'm the Gingerbread Man."). 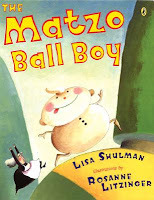 The Matzo Ball Boy, written by Lisa Shulman & illustrated by Rosanne Litzinger (Puffin Books, 2005). In this Jewish version, a lonely bubbe (grandmother) makes herself a matzo ball boy, who quickly escapes her kitchen. He taunts and eludes everyone he runs into (“Run, run, as fast as you can. You can’t catch me. I’m the matzo ball man!”), including the schneider (tailor), the yenta (village gossip), the rabbi, and even the fox. The matzo ball boy finally comes to a poor man in the woods who invites him home for Passover supper with his wife. Fair warning: the ending is not a happy one for the poor matzo ball boy.